IBM photonics chip could accelerate move to better DCs. IBM researchers have managed to produce a computer chip – or as the boffins called it, a fully integrated wavelength multiplexed silicon photonics chip - that can transmit up to 100Gbps, speedy enough to transfer 25GB or the equivalent of a Blu-ray movie in two seconds. 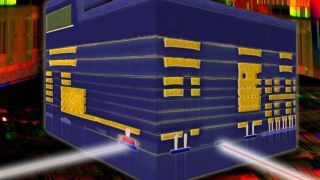 The chip integrates the necessary components (both electrical and optical) to convert data into light and vice versa, using four different colours of lights and a technology called multiplexing. Silicon Photonics has been hailed as the long term replacement for copper but that has been the case for several decades already (the now defunct Byte magazine had it as its lead story 22 years ago). It is only now that technology has matured enough to make it commercially viable. Also, because photons (in light) don't suffer from the same issues as electrons (in copper), silicon photonics is likely to give rise to more modular, cheaper, more environmentally-friendly and faster data centres. It is the ferocious appetite for data that's driving demand for photonics-based technology. "Making silicon photonics technology ready for widespread commercial use will help the semiconductor industry keep pace with ever-growing demands in computing power driven by Big Data and cloud services," added Arvind Krishna, senior vice president and director of IBM Research.